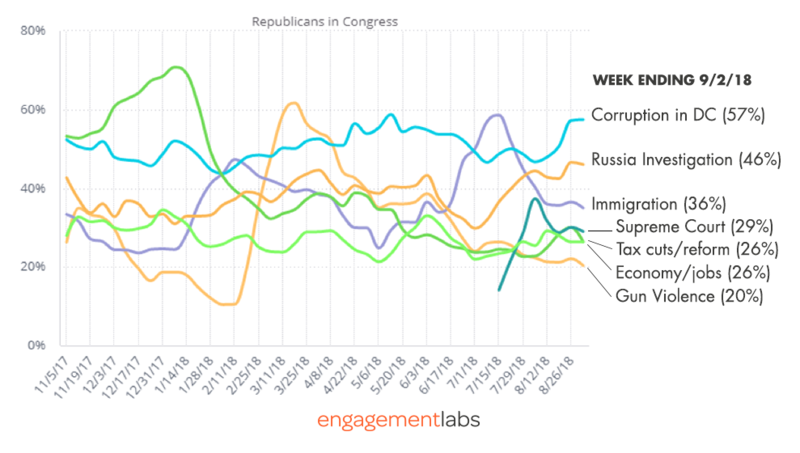 Engagement Labs has been monitoring conversations about President Trump, and about Republicans and Democrats in Congress, on an overall basis, all year long. The same methodology in 2016 produced a strong indication that the James Comey letter was most responsible for Hillary Clinton’s electoral defeat, as reported in her book, What Happened. 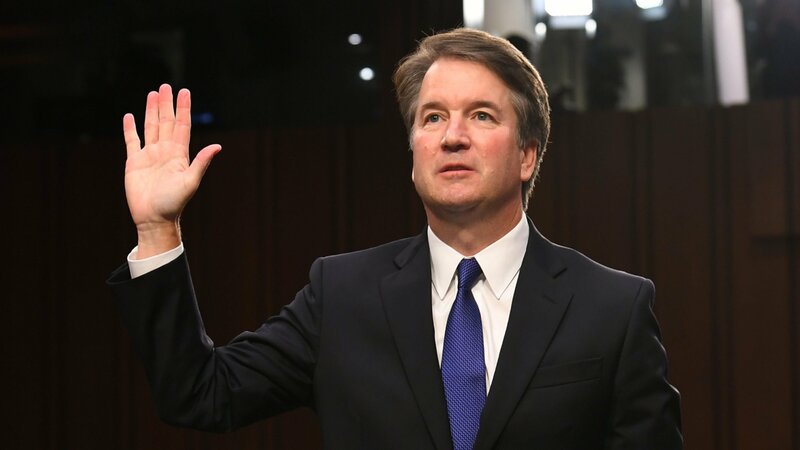 The analysis below is based on data through September 2, before the Kavanaugh Supreme Court hearings started and the publication of an anonymous OpEd by the New York Times against the President. Each day, over 40% of Americans are talking about the President and about half that number are talking about the Democrats and Republicans in Congress. The overall tone is extraordinarily negative about the President and the members of both political parties, with many more people talking negatively than positively about the key players in our current political drama, similar to the pattern we saw in 2016. However, the level of negativity is most pronounced against Republicans in Congress, suggesting significant momentum against the GOP majority in the House. The chart below tracks “net sentiment,” calculated by subtracting negative and mixed conversations from positive. 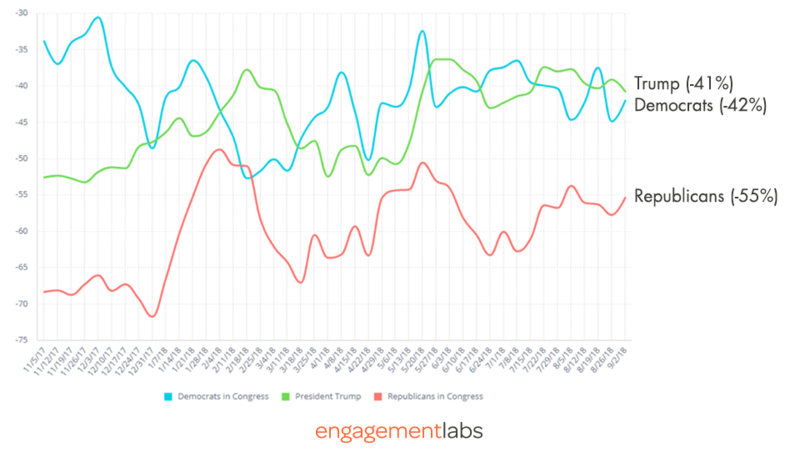 By early September, net sentiment for conversations about “Republicans in Congress” was -55%, 13 points worse than Democrats (-42%), and 14 points worse than President Trump (-41%). The conversation about Democrats has been less negative than for Republicans all year, except during the week of the Parkland, Florida school shooting when Democrats in Congress had their most negative conversations (-53%), close to the same as the negativity for Republicans at the time (-51%). Since then, and throughout the summer, the margin has been consistently more than 10 percentage points worse for the Republicans than Democrats. Throughout 2018, four different issues have taken turns as the most negative issue for Republicans, including the GOP tax reform/cut bill in January, gun violence in the aftermath of the Parkland, FL school shooting, and immigration at the peak of family separations at the border, but corruption and Russia dominated just before Labor Day. 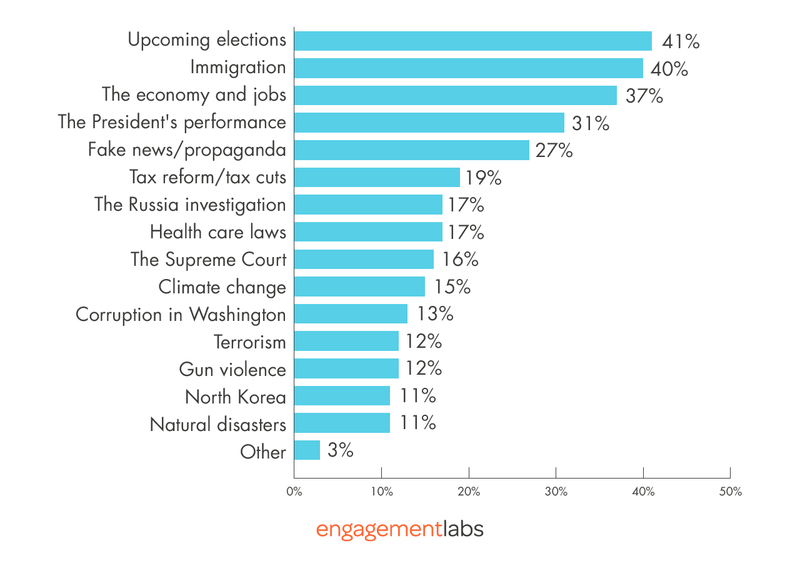 Very similar topics are driving negative conversations about Democrats in Congress, with corruption, the Russia investigation, and immigration among the top issues, although arguably these are issues that put the debate on Democrats’ turf rather than the Republicans’. The negative Democratic conversation does have a lot more discussion about “fake news“ about Democrats (31%) than Republicans (26%), however. 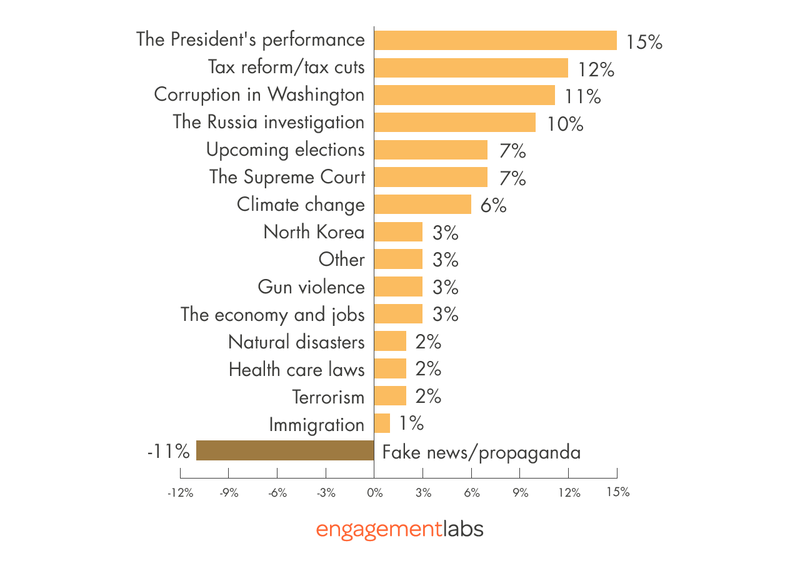 The peak of “fake news” as a negative topic against Democrats was in mid-June, around the time that family separations at the border became a major news story. Not only is the conversation about Congressional Republicans more negative than for Democrats on an overall basis, but Republicans also track more negatively on virtually every topic measured, with the sole exception of “fake news” which is a more widespread critique of Democrats than Republicans. The issues skewing most negatively toward the Republicans rather than the Democrats relates to President Trump’s job performance, tax cuts, corruption in Washington, and the Russia investigation. The topic of the upcoming elections and the Supreme Court also skew somewhat more negatively toward the GOP versus the Democrats. Interestingly, two issues that Republicans counted on as helping with the 2018 campaign—the recent GOP tax cuts and the latest Supreme Court pick, Brett Kavanaugh—seem to be more negatives than positives in late summer, before the Kavanaugh hearings started. 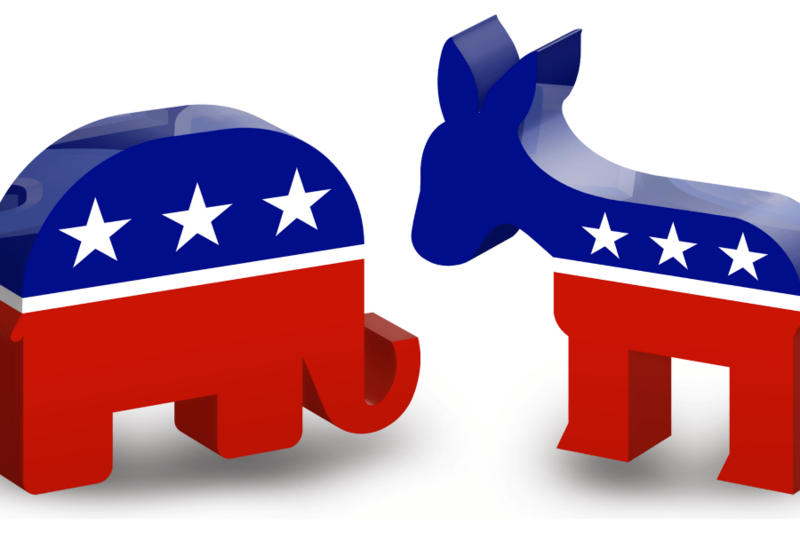 Although positive conversations are few and far between for both parties in Congress, those that do occur emphasize the “upcoming elections” for both parties, and immigration and the economy for Republicans. The President and “fake news” are also topics in more than a quarter of these conversations. Half of all positive conversations among Democrats relate to the upcoming elections, 9 points higher than for positive Republican conversations. And 31% of positive Democratic conversations relate to President Trump, presumably meaning the chance to make him accountable. 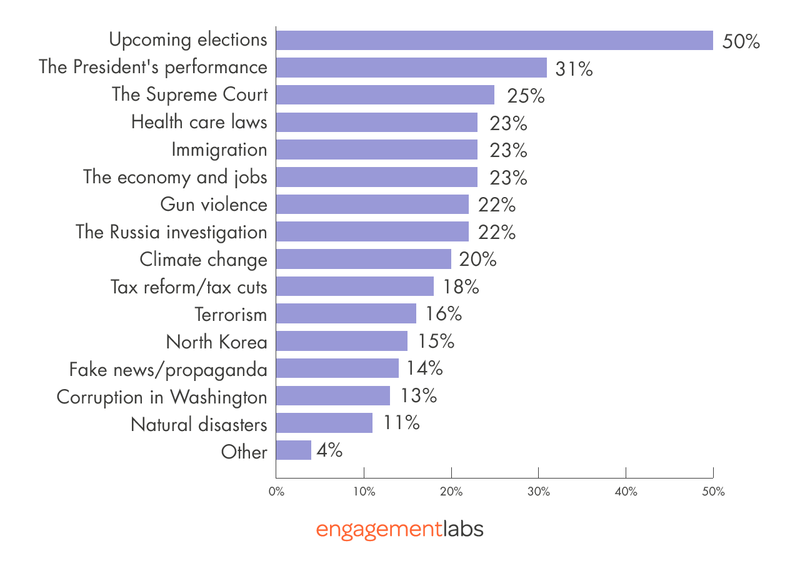 Other issues that are mentioned in positive discussions of Democrats in Congress related to the Supreme Court, health care, immigration, the economy, guns, and the Russia investigation, a broad agenda. Engagement Labs conducts an online survey continuously, with weekly reports. Conversations are reported by a representative sample of American adults via survey, a day after those conversations occurred. Most of these conversations happen face-to-face, whether at home, work, or someplace else. Overall results in this report are based on 4-week rolling averages of about 2,500 respondents 18-69 years old. All subgroups reported included at least 100 individuals who participated in surveys in Late July or August 2018.